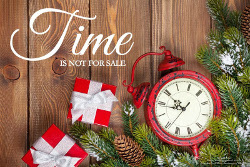 This is very true and I know only too well how time is important as I lost my husband a few months ago and really not looking forward to the Christmas holidays even though I have my children and grandchildren it will not be the same. Thank you for sharing. Oh this is very good Bill and Teddy. Thank you for publishing it in the community. I will be reposting on the Syndication Express blog too. Be blessed and enjoy your day.